Donald Trump, whose mother and paternal grandparents were immigrants, rails against both legal and illegal Latin American immigrants, which has deeply offended Latin Americans. But it’s not as if The Trump Organization hasn’t done business in Latin America. Jeb Bush has to like the Mexican illegals because of his wife. They’re bringing drugs, they’re bringing crime, they’re rapists, and some I assume are good people but I speak to border guards and they tell us what we are getting. If he ever got elected you would have people flowing across the border. Is Donald Trump’s business operation mobbed up? Is that an unfair question? Perhaps it is, suggesting guilt by association as it does. However, when somebody runs for president of the United States, those with whom she or he associates and does business reasonably do become matters of public interest. With Donald Trump, the question becomes all the more reasonable because it has been asked before and the answers have raised concern. In the current contest for the Republican presidential nomination, the question becomes relevant because Donald Trump has made sweeping broad-brush characterizations of Latin Americans and meanwhile he and his network of companies do and have done business in Latin America. Does he say those things about Latin Americans because a pollster has told him that this is what he needs to say to mobilize ultra-right support in his bid for the presidency, or because it reflects what he has noticed about people with whom he and his businesses have dealt? Trump has, after all, been involved in some noteworthy real estate ventures in Panama and Mexico, and his Miss Universe pageants do seem to show a certain preference for light-skinned Latin American women. If Trump appeals to those Americans whose stereotype of Latin Americans is that the men are all gangsters and the women are all whores, does he make that pitch as a matter of sincere personal belief based upon his own experiences? Take a poll in Panama about who is the sleaziest Panamanian of us all, and a top contender would be one Ricardo Martinelli Berrocal, now living in Miami as Panama’s legal system pursues several criminal investigations against him. Has Donald Trump said anything about this Latin American immigrant on the campaign trail? Not a peep. But it’s not as if Trump doesn’t know the man. Their photos together are all over the Internet. But all along, hasn’t Trump made the distinction between rich criminals and poor ones? Take Atlantic City as an example. Trump bought the land on which the Trump Plaza casino was built from Philadelphia hit man Salvatore Testa, the son of the one-time boss of the Philadelphia mafia, Philip “Chicken Man” Testa. A New Jersey crime commission report adds that two mafia-owned construction companies were used in the construction of the Trump Plaza. Or what about New York City, where it’s hard to do construction without running into the mafia in one way or another? In Manhattan the concrete work for the Trump Tower was done by S&A, a company controlled by the Gambino family’s Paul Castellano and the Genovese family’s Anthony “Fat Tony” Salerno. But if Trump has an issue with Mexican gangsters, might that have to do with a failed Trump project near Tijuana? The Trump Ocean Resort Baja Mexico was to be a luxury resort and condo complex. The project, about 10 miles from the US border and bearing the Trump name and images, was heavily marketed to upscale baby boomers in Southern California. Dozens of people paid hefty pre-construction deposits, more than $30 million worth, for their Trump Ocean Resort Baja Mexico condos — and nothing was ever built. Trump took his name off the project and the promoter who was left told the depositors that due to the 2008 Wall Street collapse he couldn’t get the financing he needed. Some of the money was returned, but some $22 million was “missing,” apparently spent on other things. So had Trump been burned in Mexico by a partnership with a Mexican crook? Actually, no. The main promoter of the Trump Ocean Resort Baja Mexico project was Los Angeles-based developer Jason Grosfeld. Trump more or less disavowed any connection with the project or its failure, pleading to The Los Angeles Times that his only tie was that Grosfeld had paid a licensing fee to use the Trump name and image. But 190 depositors sued both Grosfeld and Trump in a US federal district court and in 2012 out-of-court settlements were reached with both Grosfeld’s and Trump’s companies in which both paid out millions..
Will The Donald be answering questions about the Tijuana venture on the campaign trail? Probably not. Since the settlement The Trump Organization has declined comment on the matter, claiming that a confidentiality agreement that was part of the settlement prevents any public statements about the matter. And was the falling out between Grosfeld and Trump over the Tijuana fiasco all that bitter? Apparently not. At least it didn’t take the Trump name off of another Grosfeld project, the Trump International Hotel Waikiki Beach Walk in Hawaii. There has been a lawsuit over deposits there, too, but the thing was built. It seems that most of the deposit disputes were not between the Grosfeld’s company and people who had put money down with the intention of living in the condo tower, but with speculators hoping to flip units. The project was announced in 2006 and finished in 2009, with the US financial and real estate crash coming in between. Some of the would-be flippers argued that since Trump and his companies had no ownership stake in the project there was a risk that the name could be taken off of it at any time, impairing the value of the property on which they had paid deposits. Others claimed that their contracts provided that if they pulled out before closing and the units they had committed to buy were sold for more than they had agreed to pay, they would get their deposits back. Also announced in 2006 — when Panama City’s later to burst luxury condo bubble was still inflating — was the Trump Ocean Club. All along it was known that the primary developer was Roger Khafif, nor was there ever any secret that its condos were primarily being marketed to wealthy American baby boomers. But the project was announced in Trump’s offices in New York, the name was and is on the project and there were no disclaimers about the Trump name contained in the promotional materials. Indeed, Donald Trump and his three children who work for the family business made repeated promotional appearances for the project in Panama. Mr. Roger Khafif serves as the President of Newland International Properties, Corp. Mr. Khafif also serves as President of K Group developers, one of the strategic partners of Trump Ocean Club International Hotel & Tower. Mr. Khafif is a partner in 2 companies located in the Colon free zone: Kedco Fashion Corp. and Rafkas Imp/Exp. From 1978 to 1981, Mr. Khafif worked as textile engineer in one of the main textile mills of Guatemala. He serves as the Chairman of Newland. So did Khafif make a fortune as a Colon Free Zone merchant, as the platform for a career as a developer? Some very well connected Free Zone people whom The Panama News asked did not know of Khafif in any role at the duty-free import/export zone. Looking online, one finds Khafif variously described as Colombian, Panamanian and as a Florida developer. Try to find an online K Group, Newland or Khafif mention in connection with a real estate development in Florida or Colombia, however, and one comes up with a blank. In Panama, K Group comes up with references to the Coronado Country Club Resort and to a development called Emerald Bay on Isla Contadora. Coronado Country Club Resort does exist — but the actual country club, as in the place with the golf course, is the much more established Coronado Beach and Golf Resort, an Eisenmann family venture that has no Khafif or K Group connection. Khafif is also not known as a man about town in the Coronado community. Emerald Bay? One finds resorts of that name in the Bahamas and a number of other places, none apparently connected to Khafif. You find a dissolved Panamanian corporation called Emerald Bay Inc in Panama’s Registro Publico. The Registro does have company called Emerald Bay Development Inc, an Emerald Bay Associates Inc, all with with no apparent Khafif connection. (Under Panama’s corporate secrecy laws, however, the owners or managers of a company do not necessarily show up in public records.) There is an Emerald Bay SA, a property of developer Herman Bern. There are references to an exclusive and remote place on Isla Contadora in the Perlas Islands called Emerald Bay, said to be only reachable by private plane or yacht — but you won’t find photos, reviews or booking information about it online. Khafif comes up as nearly a cipher, a face posed with various dignitaries and the main guy at the Trump Ocean Club to be sure. But who is he? Ah, but of course, there is the Ricardo Martinelli endorsement. The former president says that everything that Trump and Khafif touch turns to gold. You can trust what Martinelli says, can’t you? When the Trump Ocean Club was conceived, however, Ricardo Martinelli was not president. Martín Torrijos was. If Trump had already acquired a reputation for dealings with the likes of the Genovese family, that should not have bothered Torrijos. He and the first lady, and his minister of agriculture, were using their public positions to pump a Swiss-based bogus teak plantation scheme called Prime Forestry, which also had a Genovese connection. In the present scheme of things, however, that’s not the set of ties that should concern us. Back then Khafif had a business partner, a Brazilian named Alexandre Ventura Nogueira — Alex Ventura — and in turn Ventura and Torrijos had someone in common, a Colombian named David Murcia Guzmán. Murcia Guzmán also allegedly had a Martinelli connection, and was business partners with the two sons of then Colombian President Álvaro Uribe. Alex Ventura, having skipped out on a million and a half dollar bail, is a fugitive from Panamanian justice, facing a five-year prison sentence that was handed down to him in a fraud case. David Murcia Guzmán, were he returned to Colombia, would have a 30-year sentence to serve for financial crimes. But he was extradited to the United States, pleaded guilty to laundering drug money for Colombian and Mexican gangsters and is in a US federal witness protection program. Before a falling out between Khafif and Ventura and another falling out between Murcia Guzmán and the presidents of both Colombia and Panama — which were more or less simultaneous in late 2008 — Khafif and Ventura were real estate partners in The Loft One Corporation, a joint venture between Ventura’s Homes Real Estate Investment Services and Khafif’s Newland International Properties to buy and sell apartments in an upscale Panama City residential project. Ventura was a partner in Murcia Guzmán’s DMG. David Murcia Guzmán had been selling pirated videos on the streets of Santa Marta, Colombia, but shortly after a US-backed Plan Colombia offensive on the other side of the country displaced FARC rebels from their position of being able to tax the drug trade in Putumayo department and gave that opportunity to the AUC paramilitary, the street vendor moved to Putumayo and suddenly became very wealthy and influential. The vehicle was DMG, an investment scheme that looked an awful lot like a Ponzi-style pyramid swindle. Eventually the Colombian authorities called it that, but had it been such it should have collapsed under the weight of demands from later investors. It never did. There was always a lot of cash coming in. US authorities called it a drug money laundering scheme. Various Colombian media identified Murcia Guzmán with the Valle del Norte Cartel, at the time when the erstwhile CD vendor got rich associated with the AUC. Also by that time the AUC had acquired such an odious international reputation from a string of massacres that it had been placed on the US list of terrorist organizations. In the fall of 2008 Ventura was in addition to the Loft One business with Khafif engaged in pre-construction sales of condo units in the Trump Ocean Club. Ventura claims that he had been a guest in Donald Trump’s home, which Trump denies. Then Colombia’s Uribe administration, most probably at the behest of US authorities, came down on DMG, branding it a pyramid scheme. At the time Murcia Guzmán was in Panama, tooling around in a fleet of Ferraris, Maseratis and Lamborghinis, guarded by SPI presidential guards, escorted around customs and immigration officers at the airport by the National Assembly’s protocol staff and apparently — although all politicians involved deny it — making large and illegal campaign contributions to candidates of both Torrijos’s Democratic Revolutionary Party (PRD) and Martinelli’s Cambio Democratico party (CD). Paper trails, accounts in US Embassy cables revealed by WikiLeaks and the local gossip had both leading presidential candidates for the 2009 elections, the PRD’s Balbina Herrera and CD’s Ricardo Martinelli, on the take from Murcia Guzmán. Who was the conduit through whom Murcia Guzmán’s money got into the 2009 Martinelli campaign? Rumor had it that it was the brother of Murcia Guzmán’s pilot. The pilot’s brother would be one Salomón Shamah, Martinelli’s tourism minister and perhaps the innermost member of the former president’s inner circle. See Mr. Shamah in the photo at the top of this story, with the younger Trumps and Roger Khafif. When the DMG scandal broke Kahfif dropped Ventura like a hot rock, and accused the latter of swindling him out of more than $800,000 in an investment scheme related to apartments in a building that was never intended to be built. That’s the basic complaint for which Ventura was sentenced to prison and skipped the country on an appeal bond. Meanwhile, Ventura defended Murcia Guzmán, appearing with two others at a press conference organized by the latter’s defense lawyer. With Ventura were a man of Belorussian origin, Alexander Altshoul, said to be like Ventura a partner in DMG, and American attorney Juliette Passer. Altshoul, according to claims asserted in a Canadian court, is a member of the Russian mob. (The court did not rule on that claim, but held that is was beside the point in the matter of a lawyer who said that he stole under duress from Altshoul.) Passer also has a Russian connection, as adviser to the Committee of Economic Development of St. Petersburg for the development of free economic zones — in the Yeltsin-era years of 1990-93 when Russia’s oligarchy and mobsters were rising in tandem and looting what was left of the fomer Soviet Union. Now that Trump is making a pitch for the white racist vote at the expense of Latinos, Latin American media are re-examining The Donald’s history in Latin America. The Colombian newspaper El Espectador recently recounted “The Trump Bubble in Colombia,” a tale of a decade of business exploration by the Trumps in that country. Describing Donald Trump as “the anti-Latino candidate,” El Espectador’s tale starts in 2005, with Khafif and Ivanka Trump in Colombia, looking to bring a Bogota company in on the Panama City project. 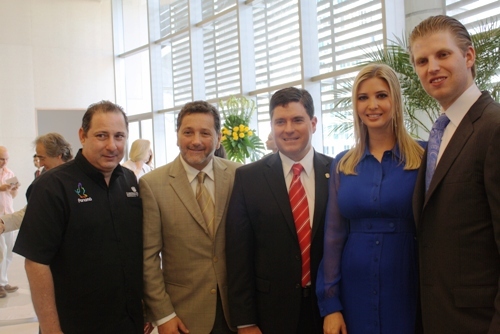 Ivanka and Donald Trump Jr. were back in 2006, discussing a possible project in Cartagena and trying to arrange a meeting with then President Uribe. They never got their meeting with Uribe. Would an awareness of Trump’s Atlantic City and New York mob ties have scared Uribe off? Or were a younger generation’s questionable ties — the people around DMG — a warning signal? Or was it The Trump Organization’s de facto director for the Latin American region, financier Camilo Benedetti? Benedetti worked out of New York and is the brother of now senator Armando Benedetti, who was president of Colombia’s House of Representatives when the Trumps were trying to get a meeting with Uribe. At the time Armando Benedetti was politically aligned with Uribe, but when Uribe and his successor Juan Manuel Santos parted ways Benedetti went with Santos. In the waning days of the Uribe era, in 2009, Camilo Benedetti came under investigation for an alleged scheme to defraud the Colombian government of oil royalties. That case seems to have gone nowhere, and in 2011 Donald Trump Jr. got a meeting with now President Santos, along with both Benedettis. But when Univision looked into the Trump and Benedetti connection, stories shifted. First it was that the Trumps didn’t know of Camilo Benedetti’s legal troubles. Then they did know, but considered it irrelevant because Benedetti was just an intermediary in the questioned transaction. Then Camilo Benedetti allegedly never had any business connection with the Trumps. Is it a matter of Donald Trump having insulted Latin Americans, who are now ganging up on Donald Trump? It could be. However, the hard questions about Trump associating with underworld figures, in Latin America and elsewhere, have been around for years. It’s a long road to the November 2016 US presidential elections. The conventional wisdom is that a Republican needs at least 40 percent of Hispanic voters to win the presidency. It’s not easy math because the Hispanic constituencies in the United States are by no means a fungible mass, let alone a solid voting bloc. The largest and oldest components of the Latino ethnic groups, the Mexican-Americans, Cuban-Americans and Puerto Ricans, are each subject to a different set of immigration rules, for example. There are Spanish-surnamed Americans who are entirely assimilated into the Anglo culture and speak no Spanish, but there are more than 40 million people in the United States for whom Spanish is their first language. Among Latinos here are differences of class, religion, race and political ideology. Perhaps Mr. Trump has found a way to discard all such distinctions and ride an anti-immigrant, anti-Latino wave to the presidency. Even if he has, however, as with the aborted Tijuana adventure, Panama City’s Trump Ocean Club may cause the presidential hopeful headaches that are not “a Latino issue.” There are grievances, and most of the people who are raising them aren’t Hispanic. They tend to be white people with more money than most Americans, a demographic segment to which Republicans try to appeal. Panamanian corporate secrecy keeps us from knowing whether the Trumps retain an ownership interest in the project here, and if so what that would be. But a group of people who put down deposits on condos there went to a federal court in Florida, complaining that they were sold a project with the Trump name and with representations that The Trump Organization would run the hotel and casino, the latter two plans having then been changed. The plaintiffs also claimed that they had been told that those who put down 30 percent of the purchase price as a deposit would get financing of the rest from The Trump Organization, and that those who had paid deposits for two units could resell one at a profit before they would be required to close on the second, and the promises were not kept. Under US law those sound like material breaches of a contract, which would in equity at least give the depositors the right to cancel the deal and get their money back. However, the contracts specified that any dispute was to be resolved in a Panamanian court. In Panamanian law (as in the Civil Code family of legal systems generally), principles of equity as known in the Anglo-American Common Law don’t exist as such. The court in Florida dismissed the depositors’ complaint without prejudice, allowing that if it turns out that there is no semblance of justice for them in the Panamanian courts they could come back and refile their suit. The process in Panama would take years, maybe decades. The rule was different for Mr. Khafif’s Newland International Properties, which faced default on some $220 million in bonds it floated to build the Trump Ocean Club. Khafif’s company went to a US federal court in New York and filed for Chapter 11 bankruptcy reorganization. Newland alleged that problems getting banks to finance upper end real estate led them to the bankruptcy, and the judge approved their petition. The concerns of condo flippers who gambled and lost their deposits, or of bondholders who got wide-eyed about the Trump name and now won’t get paid back as quickly as they thought they would, probably won’t move a large portion of the US electorate. Especially so, when Trump can say that it wasn’t him but the other guy. Early polls suggest that even Trump’s own four bankruptcies don’t offend too many likely Republican primary voters. However, the grandson of German immigrant Friedrich Drumpf and son of Scottish immigrant Mary Anne MacLeod has made complaints about immigration and stereotypes about Latinos the centerpieces of his presidential campaign. So how persuasive will he be to Republicans if it is perceived that he hooked up in a business venture with Latino characters who have underworld ties, and when things didn’t go right it was upscale white American investors who ended up with the short end of the stick?